Bulk SMS v/s WhatsApp Messaging - Which One Provides Better ROI? In the last decade, the growth off Over-the-Top (OTT) instant messaging apps like WhatsApp has been phenomenal. While WhatsApp is an important medium of communication these days, does it live up to marketing expectations? Small and big business owners frequently use Bulk SMS Services to reach out to their target market of users and effectively convert them via promotional messages. Can marketing experts use WhatsApp messaging system to perform similar reach out activities? Let us explore the marketing potential of both Bulk SMS and WhatsApp, and try to understand which of them offers a better ROI. Bulk SMS service providers like BroadNet offer all kinds of SMS packages catering to myriad needs of the marketers. The outreach possibility is unlimited because there is no cap tothe amount of messages a marketer can send to its target audience. However, with WhatsApp, the outreach possibility is limited to 256 recipients if the marketer sends a “broadcast”. Further, since the recipient will not have the marketer’s contact number before receiving the message, it is likely that the message will not gain any traction. If the recipient still sees the message, it will most probably be marked as “spam” and deleted. It looks like a violation of the recipient’s privacy. This kind of attitude is rare with bulk SMS outreach. Here, the marketer and the recipient is aware of the “cold” nature of the outreach; however, SMS has 93% open rate that leads to quite a several conversions. Bulk SMS is not usually referred to as a violation of privacy. The functioning of WhatsApp messages depends on an active Internet connection, which is not the case with SMS receivers. SMS receivers do not need to have an Internet connection. Given the fact that marketers need to reach a wide audience base, bulk SMS comes across as a better way because even a basic feature phone user has the SMS facility. Any marketing outreach through bulk SMS service will receive a higher delivery rate than WhatsApp messages. 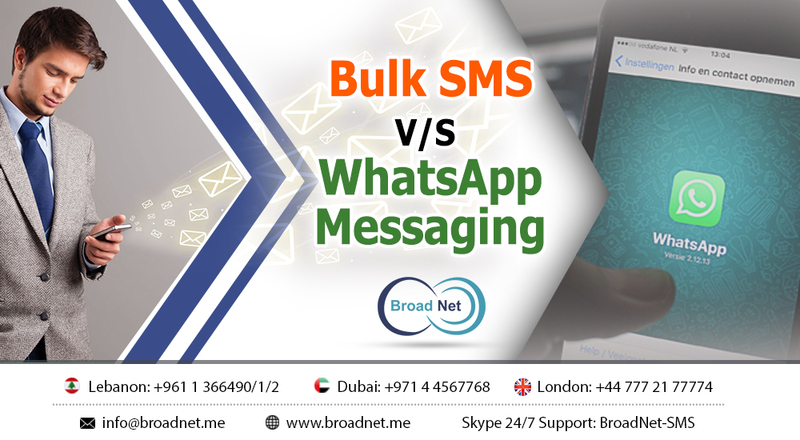 Broadnet Delivers Bulk SMS Content to over 140 countries with an active partnership of 400 network operators. Broadnet gives marketers a platform to reach out to an audience in various countries. With bulk SMS services, marketers need not worry about reaching the end users because of each handset, anywhere in the world, comes pre-installed with the SMS service. The user need not install any software at all. However, WhatsApp must be installed on the mobile device for using. This limits the marketing traction because the sender has no way to comprehend whether the receiver has WhatsApp activated on the device or not. The only way is to add the receiver in contacts one-by-one, refresh WhatsApp, and check whether the new contact has the messaging service or not. It is certainly a tedious process to undertake and an impractical one. Therefore, opting for a Bulk SMS Marketing Services is sensible for any marketer because the limitations with WhatsApp messaging services do not apply to SMS service. One can argue that marketing with WhatsApp is almost free because the only cost a marketer incurs is the cost of the Internet. Given the availability of cheap Internet plans, the cost is almost NIL. In comparison, bulk SMS would seem costly because marketers are charged per SMS sent basis or charged through a credit system, but if one considers all the above factors, SMS should truly be the preferred option. SMS outreach is unlimited; WhatsApp outreach is limited. SMS has higher CTR; WhatsApp marketing is perceived as an inrusion of privacy. SMS does not require any software installation; WhatsApp does. SMS delivery rate is higher than WhatsApp. SMS marketing is legal; WhatsApp TOS prohibits business generation / marketing messages. Due to the above factors, any analytical marketer will understand that bulk SMS marketing is a better option. Through it, one can conduct well written and well times SMS marketing campaigns. Bulk SMS marketing from Broadnet is reliable, low cost and widely accepted in myriad countries.